West Highland Terriers are a spunky and fun smaller breed of dog that needs a lot of mental stimulation to prevent them from becoming bored. For dog parents, this can be a challenge when you’re trying to balance between finding a durable toy that is also fun and interactive. This is why we rounded up and reviewed the best toys for Westies that showcase a broad range of different types of toys ranging from plush to puzzles. However, we want you to take a look at our buyer’s guide before you get to the reviews because this buyer’s guide will give you essential criteria to keep in mind when you shop for your next dog toy. As small and fiery as this breed of dog is, they require more durable toys to withstand the dog’s natural prey drive. Westies were originally bred to be working dogs to help exterminate rodents, and this prey drive carries strong today. This means that your dog will naturally be harder on their toys, and this includes chewing, burrowing, and just generally tossing them around as they play. Buying toys for Westies is an interesting mix of getting a durable toy that will also stimulate them mentally. Westies are also a very smart breed of dog that gets bored easily without routine stimulation, and this is where the puzzle element of the toys come in. The key is to keep your dog interested in their toys instead of your items, and giving them a rotating series of toys is usually an excellent tactic. These dogs also have a lot of energy that has to be expelled somehow during the day to keep any destructive tendencies in check. Getting them toys that they can chase around is a good idea because it’ll fulfill their prey drive while tiring them out as play with it. Puzzles – Dog puzzle toys usually involve a treat at the end of some type of puzzle. You can get balls that dispense treats when your dog moves it around, puzzles that require your dog to open a door, and puzzles that make your dog look for the treat or plush. Chewing – Chewing dog toys are dog toys that are specially designed to withstand heavy chewing and rough play. They usually come with minimal stuffing or no stuffing, more durable materials, and reinforced stitching. Plush – Some Westies like to carry around and sleep with plush toys. These toys can come with a squeaker to keep your dog entertained, and these toys also have more stuffing with a soft outer layer. 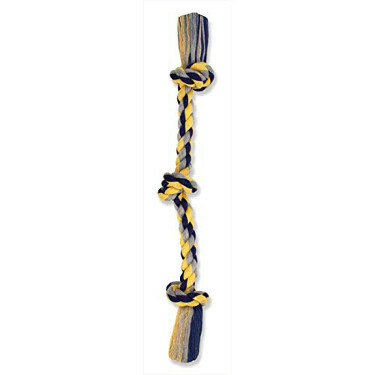 Rope – Rope toys are literally long pieces of cotton rope with several knots tied at varying length along the rope. Your dog can toss these around, chew on them, and play tug of war with you or another dog in the house. Fetch – Fetch dog toys are toys that are very easy for you to throw for your dog to chase. They can be slightly weighted balls, frisbees, plush toys, or knotted balls that mix a rope toy with a throwing toy. Kongs – Kong toys are designed to withstand heavy chewing or playing. They’re durable rubber toys that usually come with a hole that dispenses treats when your dog plays with it. There are several buying considerations to keep in mind when you’re shopping for a new toy for your dog. Ensuring that your dog’s toys have some or all of these traits can help them last longer. Since Westies can be more aggressive when they play with their toys, it’s essential that you get a toy that is durable enough to withstand this rough play. Look for things like minimal stuffing, reinforced seams, a durable outer material, and no hanging pieces that your dog can grab on and tear away. You want to get a toy that isn’t too big or too small for your dog to pick up, carry around, or toss around when they play. You can look for toys that come in a few different sizes that allow it to grow with your dog, and make sure that the toys you pick are easy to care for. Your dog’s toys are going to get dingy and grimy because your dog will drool and chew on them as they play. Whichever toy you choose should be easy to clean and maintain, and this includes being able to toss them into the washer and dryer whenever they need a refresh. It’s important to pick out age appropriate toys for your dog, and this is especially true if you’re worried about your dog swallowing parts of it. As a general rule, you don’t want to buy toys that are small enough to fit behind your dog’s back molars because they can choke on it. The texture of your toys will largely depend on your dog’s tastes because there are several available. You may have to try several different textures before you find out which one your dog prefers to have over the other types. This durable and soft squeaky toy by Kong comes with minimal filling, and this minimal filling helps you to have less mess if your dog manages to tear a hole in it. This toy also comes with an additional material layer that helps to protect the toy from damage when your dog chews on it or tosses it around. The two different sizes make it easy to customize your order to suit your dog’s tastes and needs. You can also choose from nine different animal characters that range from light colors to darker colors, and the eyes are sewn in for added durability and longevity. This toy is very easy to clean and maintain because you can just toss it in the washing machine and dryer when it gets grungy or dirty. Additionally, it comes with a squeaker sewn into the body of the toy that can help to entice your dog to pick it up and play with it. Westie parents who bought this toy for their dog liked that it came in two different sizes that allowed them to pick the size that worked best for their dog’s size. Westie parents did say that the squeakers weren’t the most durable because they broke easily. This puzzle toy dispenses treats when your dog moves it around and plays with it. You can adjust the toy through several difficulty levels as your dog learns how to get the treats out, and this toy comes with a clear side that allows you to see how full it is. The ball comes designed to be very easy to twist apart into two halves for easy and thorough cleaning. You can use a variety of soft or hard treats with this toy without a problem, and this toy works very well for several different treat sizes and shapes. The toy is available to buy in two different sizes and two different packaging options. The build material is a very strong and non-toxic plastic that is built to withstand extended play sessions, and the toy is lightweight enough for smaller puppies to push around without a problem. Dog parents who bought this interactive treat toy for their dog were happy that it came with a clear plastic side that allowed them to measure the treat levels at a glance. Dog parents did mention that this hard plastic toy wouldn’t be able to withstand chewing without cracking or breaking. This plush puzzle toy stimulates your dog with a fun game of hide and seek, and this toy also comes in several different sizes that allows you to tailor the toy’s size to suit your dog’s size. 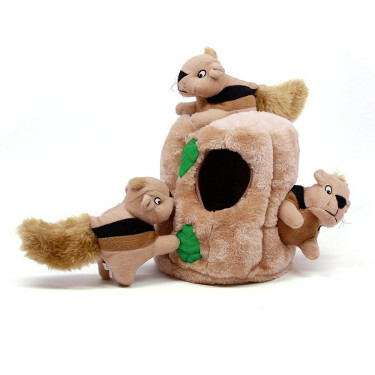 You get three plush squirrel toys along with the tree trunk plush when you purchase this item, and each of the squirrels come equipped with a squeaker to help get and hold your dog’s interest. 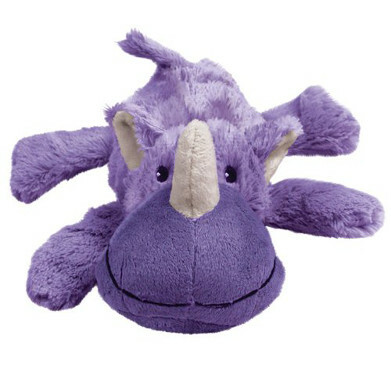 You can order more of the plush animals if your dog needs them, and there are hidden squeakers in the base of the toy. The plush animals also double as a fun fetch toy because they’re slightly weighted for throwing purposes. Your dog will be able to stay entertained as they work out how to get the toys in and out of the tree trunk, and it’s easy to clean by throwing it into the washer and dryer. People who bought this interactive toy for their dog liked that they could use it as a hide and seek toy as well as a fetching toy. People did mention that the larger size may not be big enough for very large breeds of dogs because the holes are too small. 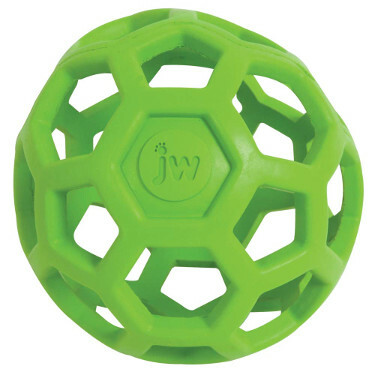 This durable rubber ball comes in five sizes ranging from mini up to jumbo, and the body of the ball comes made out of a durable and non-toxic rubber material. The unique design lets your dog pick it up, toss in around, and chew on it without fear of destroying it. 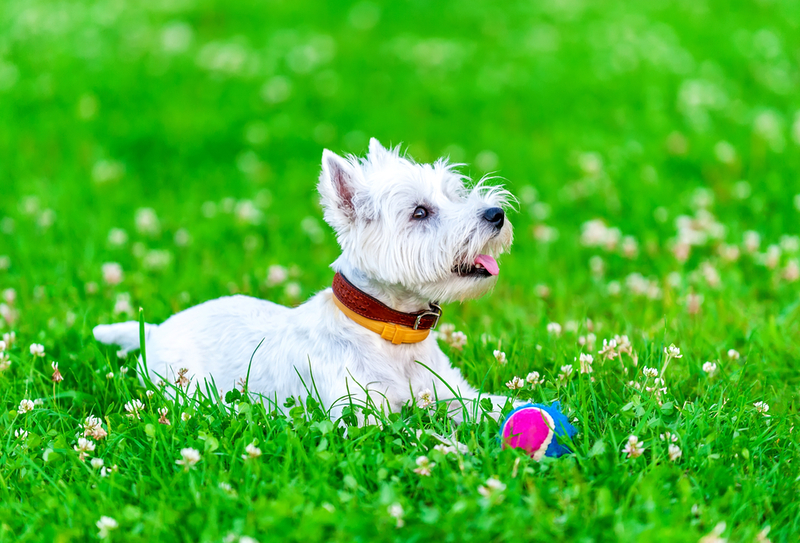 The different sizes allow you to buy toys that grow with your dog, and this is great news if your Westie gets really attached to it and outgrows it. It comes in very bright and bold colors that are very easy to see and keep an eye on when your dog plays with them outside. 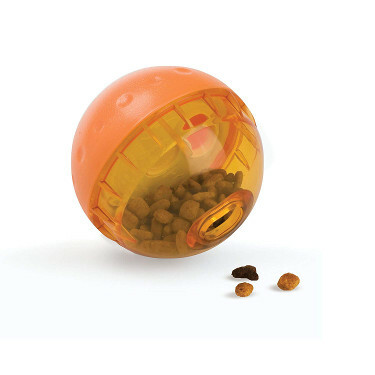 This chew toy doubles as an interactive treat ball that allows you to stuff it with larger treats and let your dog figure out how to remove them. The breathable design ensures that your dog is able to chew on this toy for hours at a time without worrying about it cutting off their airflow. Dog parents who purchased this toy for their dog liked that they could pick from a few different sizes and quantities when they ordered. Dog parents did say that this toy doesn’t stand up well to very aggressive chewing without breaking down. This colorful rope toy is just over two-feet long, and this rope toy features three durable knots that your dog can chew and tug on when they play. It comes in five different sizes ranging from tiny to jumbo, and the rope fibers act as a natural floss for your dog’s teeth when they use it. The rope toy is made out of 100% cotton fibers that are safe if your dog should happen to swallow a piece of it, and the durable construction makes it difficult for your dog to shred it. This toy is a great option for a multiple dog household, and this toy lets several dogs play at one time. Your dog’s teeth will get a thorough cleaning each time your dog plays with it, and you should start to notice that your dog’s teeth and breath are healthier when they play with it. The bright color combination makes this toy easy to spot if your dog takes it outside to play with it as well. Westie parents who bought this rope toy for their dog were pleased that they could pick from a few different sizes when they ordered it. Westie parents did point out that this rope toy’s ends tended to fray with repeated chewing. Our pick for the best toys for Westies is the KONG Cozies Dog Squeaky Toy because it’s a softer option that still manages to withstand chewing because it has an additional layer for protection. We also liked that it had a smaller amount of stuffing that made less mess if it got a hole in it. The two different sizes that came with this toy made it easy to pick out a size that corresponded with our dog’s size. Finally, this toy was very easy to keep clean because we could wash it dry it in the washer and dryer without a problem.